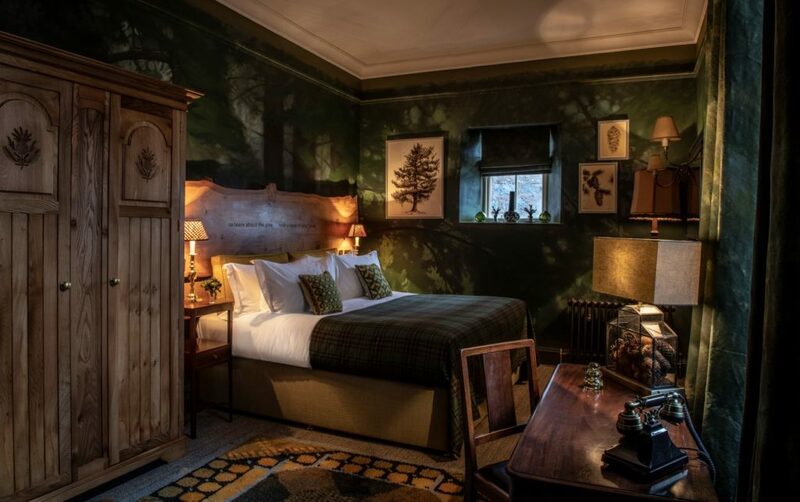 The Fife Arms, Braemar, has reopened its doors following a complete restoration project which has brought back the splendour of the former Victorian coaching inn and will once again establish it as a hotel for the Scottish highlands. Within the magnificent Cairngorms National Park, the hotel lies at the heart of the historic village of Braemar which attracts thousands of visitors to its annual Braemar Gathering. 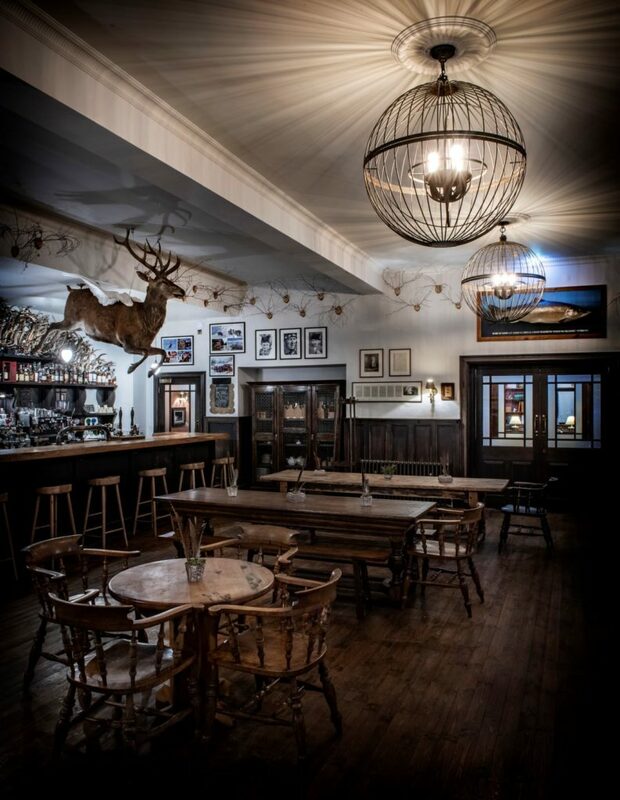 Owned by Iwan and Manuela Wirth of internationally acclaimed art gallery Hauser & Wirth, The Fife Arms brings together Scottish heritage, craftsmanship and culture with world-class contemporary art and a strong sense of community. 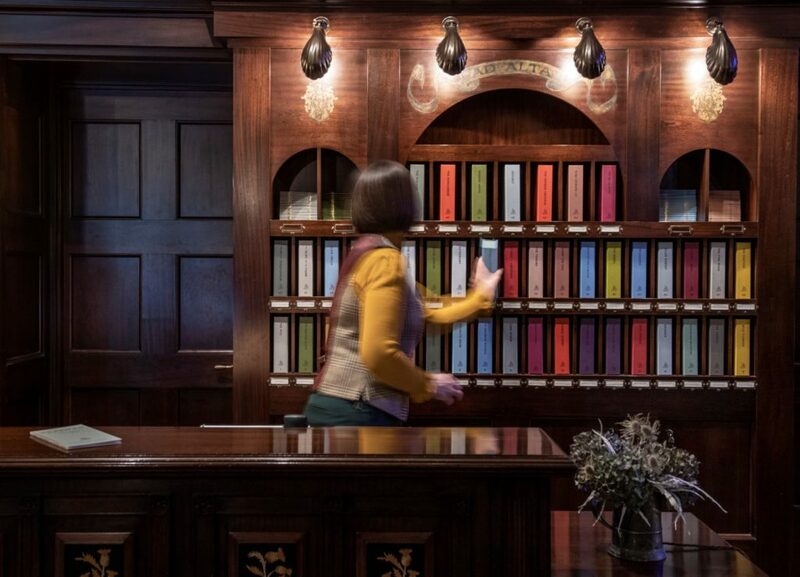 The interiors are by Russell Sage (The Zetter Townhouse; The Goring; The Savoy Grill) and feature over 12,000 historic objects, artwork and artefacts that have been collected over three years in order to tell some of the many stories associated with Braemar. 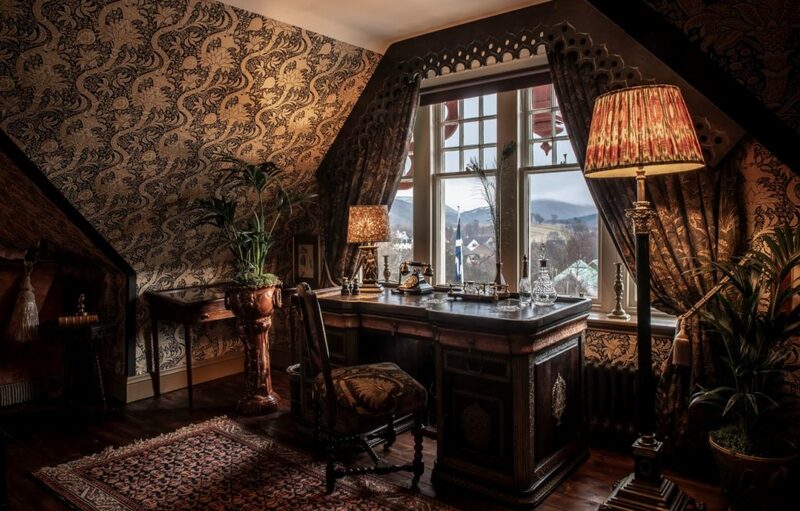 The hotel’s 46 suites and bedrooms have all been individually designed with unique furnishing and décor – each one a homage to place, person or event with links to the area; such as Robert Louis Stevenson, who began to write his classic novel Treasure Island in Braemar. A cover of Treasure Island and several other famous Scottish tomes are shown above. 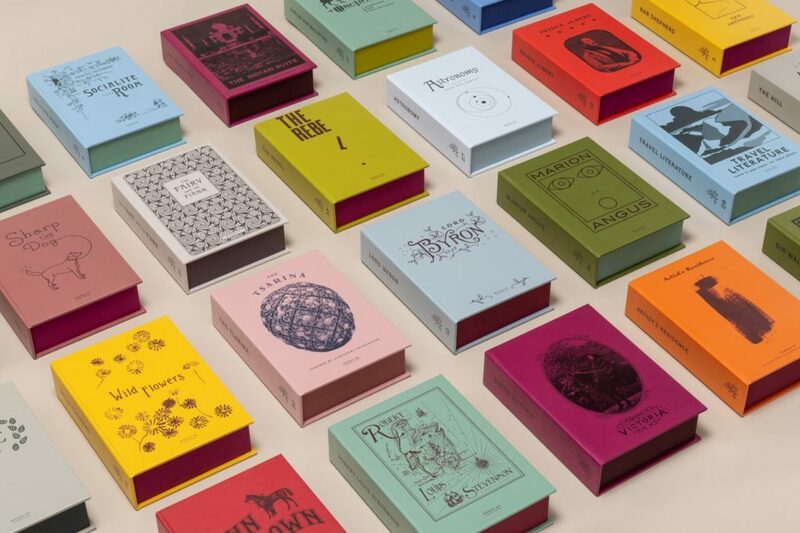 These are fake books, designed by the hotel’s brand specialist, Here Design, and contain the hotel room keys. 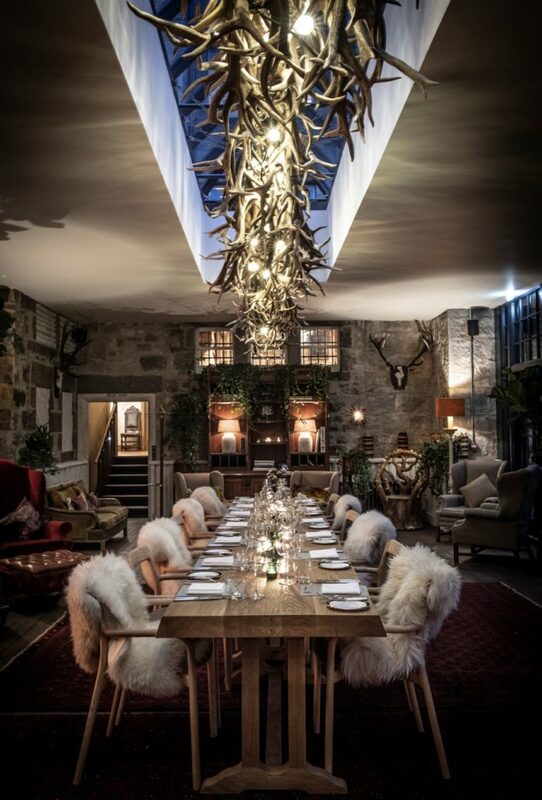 The Fife Arms offers several bars and restaurants including The Clunie Dining Room, with a focus on wood-fire cooking, the hotel’s much-loved traditional public bar, which is now called The Flying Stag, an elegant Drawing Room that will serve afternoon tea and Elsa’s, a chic art-deco cocktail bar that is inspired by legendary fashion designer Elsa Schiaparelli, who visited Braemar. 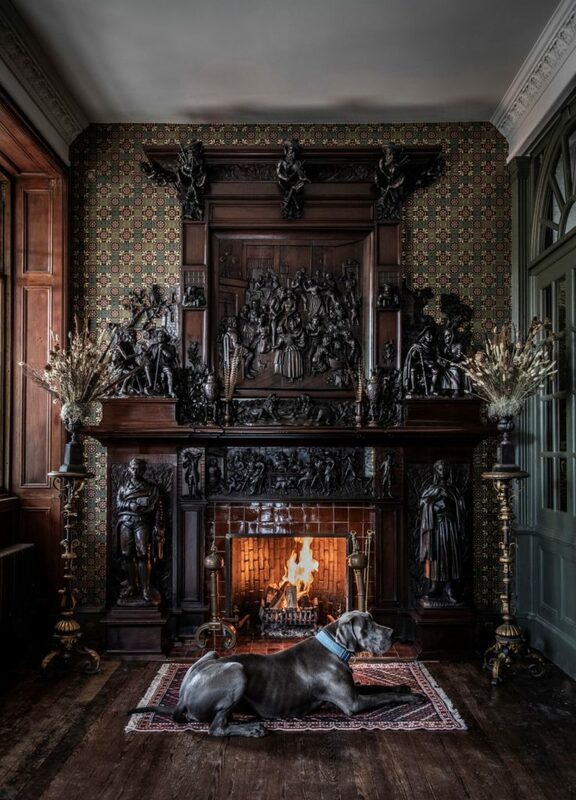 In keeping with the Wirth’s dedication to contemporary art, The Fife Arms features prominent works specially commissioned for the hotel from internationally renowned artists such as Zhang Enli, Guillermo Kuitca, Subodh Gupta, Bharti Kher and Richard Jackson. James Prosek has designed the hotel’s striking coat of arms which includes the Flying Stag after which the public bar is named. While the reception features a special Steinway piano that is a unique collaboration with American artist, Mark Bradford. These contributions are complemented by an outstanding array of mainly Scottish artworks collected for the hotel, from important paintings and drawings to prints, pamphlets, caricatures and even a delicate watercolour of a stag’s head painted by HM Queen Victoria. During the hotel’s renovation, a number of other artists were invited to take up residence in Braemar and to immerse themselves in the atmosphere of its surroundings. Among them was Scottish luminary Alec Finlay, who was commissioned to create “gathering,” a poetic guide to the Cairngorms. Words taken from this poem have been carved into the custom-made wooden bedheads in many of the guestrooms of The Fife Arms. Gideon Summerfield, a recent postgraduate from London’s prestigious Royal School of Drawing, has drawn portraits of many of Braemar’s several hundred residents and a selection from his resulting “Characters of Braemar” series hang in The Flying Stag. Moxon architects, based in Crathie and London, has overseen the refurbishment. Headed up by Ben Addy, who grew up in Aberdeenshire and is a Director of the Cairngorms Trust, Moxon has executed a careful restoration of the listed building. The house tartan and tweed, used throughout the hotel, have been designed by Araminta Campbell, who grew up in Royal Deeside. Chelsea Flower Show and RHS medalist, Jinny Blom, has remodelled the riverside garden, which overlooks the River Clunie, and links the main hotel to the spa, which will offer treatments inspired by the Scottish landscape. 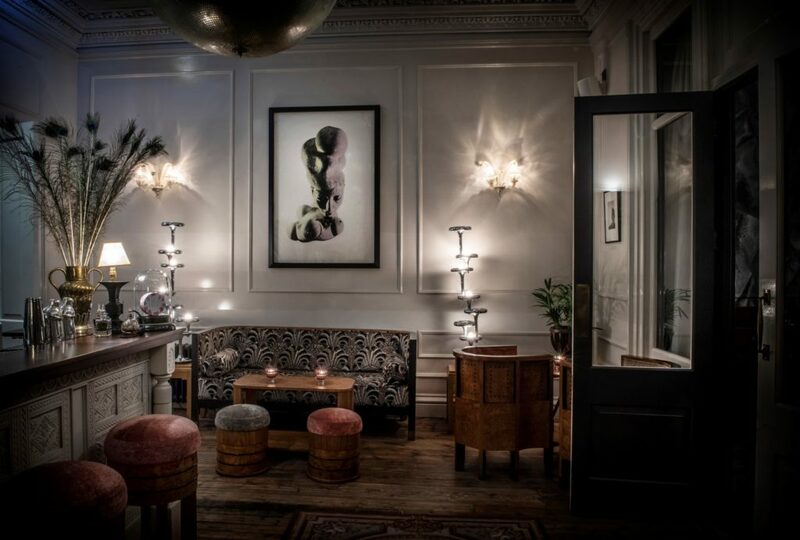 “I’m personally excited about the little spaces which can often be forgotten in hotels” says designer Russell Sage. “Here they become an essential part of the story; be it the route of a small staircase between bedroom floors, which showcases 100 pieces of taxidermy; a corridor leading to a single bedroom, which now becomes a glorious private gallery, or the lift which becomes a pine cone grotto assisted in its construction by the people of Braemar. Iwan and Manuela Wirth own a beloved family retreat in the vicinity of Braemar. They are co-Presidents of Hauser & Wirth, admired as one of the world’s most important and influential galleries for modern and contemporary art. The Wirths set up Hauser & Wirth with Manuela’s mother, Ursula Hauser, in Zurich in 1992. The gallery is now a global enterprise with seven locations worldwide. Iwan and Manuela were jointly ranked as the most powerful and influential figures in the art world in ArtReview’s 2015 Power 100. They are also the founders of a new hospitality enterprise that combines love for art, culture, and food with a dedication to building community and fostering environmental sustainability. 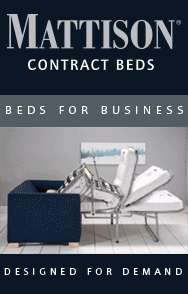 Their hospitality projects to date include the Roth Bar & Grill and Durslade Farmhouse in Bruton at Hauser & Wirth Somerset; The Bull Inn at Hardway in Bruton; Manuela Restaurant at Hauser & Wirth Los Angeles; and now The Fife Arms Hotel in Braemar, Scotland.